We have collected and analyzed 4 expert reviews and 12 user reviews from international sources. Experts rate this product 67/100 and users rate it 97/100. The average review date is Sep 7, 2017. We have compared these reviews to 436424 reviews from other Monitors. The alaScore™ for this product is 94/100 = Excellent. Last update: Apr 23, 2019. 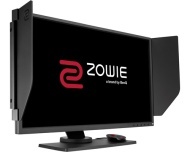 The Zowie XL2540 is a 24.5in monitor with a 1080p screen, which makes it £390 price look huge – so it's going to have to work hard to justify the outlay. Zowie set its stall out early with this screen, which has a high price but numerous features that’ll give competitive gamers an edge: the 240Hz refresh rate is huge and enables fast, smooth gameplay, and the 1ms response time is excellent. ... for those who are playing for pleasure it's worth trying out the difference.